The 24-year-old physics student had travelled from Kathmandu to his home for Dashain, the longest and most auspicious festival on the Nepali calendar. This year, along with the other villagers of Chimling Beshi, he was celebrating it in a temporary shelter. It seemed a bittersweet coincidence that Dashain – which celebrates the victory of good over evil – overlapped with the six month anniversary of the worst natural disaster to hit Nepal in 80 years. We had set out for Sindhupalchok earlier that day on a bus packed with men, women and children wearing their best clothes, foreheads adorned with red tikas, on their way to visit relatives. Our overloaded bus climbed into the hills, swinging perilously around the corners of the twisting roads. 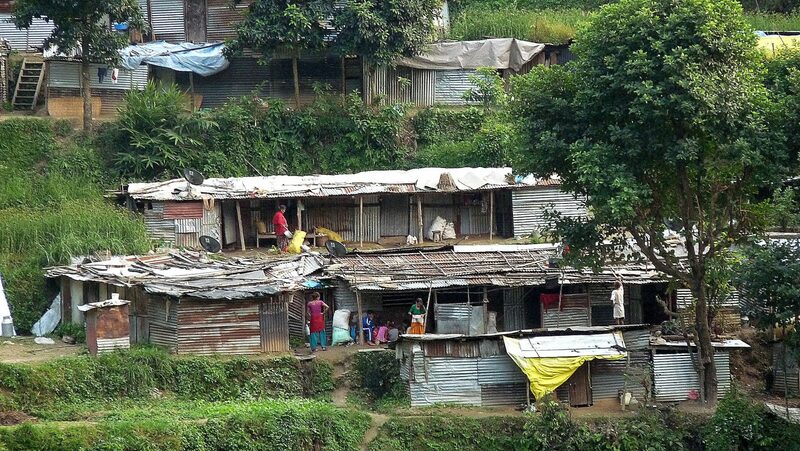 The road journey felt dangerous, but when you look at the small, fragile houses on the hillside, many of them partially or completely destroyed, you realise that precariousness is a part of everyday life in this part of Nepal. 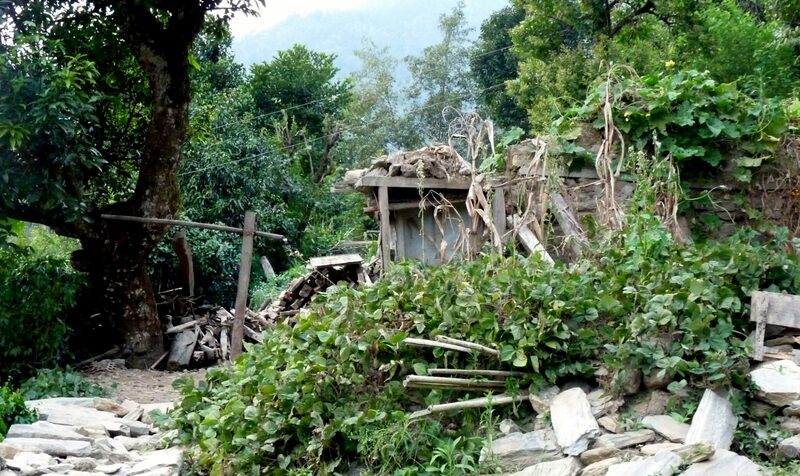 Chimling Beshi is one of many villages in Sindhupalchok district that was destroyed by the earthquake in April. Every house suffered severe damage and was rendered uninhabitable. The district suffered more devastation than any other, with around 3,500 deaths and nearly 64,000 houses – around 90 per cent –listed as ‘fully damaged’. The village is part of Mankha, the second most badly affected Village Development Committee in the district, where more than 7,500 people required immediate assistance after the earthquake. Six months after the earthquake, we were on our way to spend the night in the village, to see how life had changed for its inhabitants since the disaster. AFTER WE CLIMBED a steep path from the nearby town of Khadichaur, rows of glinting metal roofs peeking out of lush foliage came into view. The small shacks were built by the villagers within a week of the earthquake, using materials salvaged from their ruined houses and bamboo from the forest. Below the six rows of tin houses stood three temporary school buildings for the younger children, built by NGOs shortly after the earthquake. Other than 25 kg of rice per household and some tin sheets, the villagers received little in the way of relief goods. It was difficult not to feel a sense of sadness at what had happened to this community. And yet, Chimling Beshi was full of life. 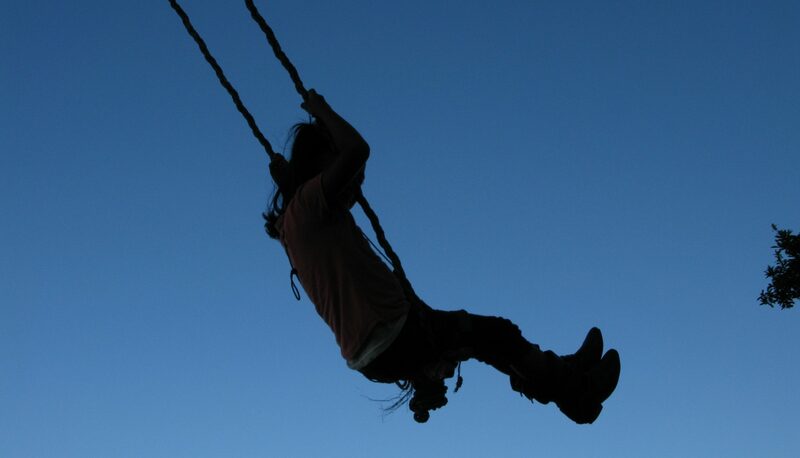 Children were playing cards, elders were placing tikas onto the foreheads of their younger relatives, and the villagers had built a giant swing (called ping in Nepali) for Dashain. But the scene was very different at the site of the old village, which stood a short trek away, on an adjacent hill. Within six months, the jungle had consumed what remained of the village. The trails were hidden under a blanket of moss and grass, and creepers and wild flowers grew on the broken walls of what used to be houses. It was hard to imagine that the same place was a thriving, sustainable community, and that these ruins used to be homes, which echoed with laughter. Babies were born here, elders had died here – but now nothing remained except for the ghost of a settlement. 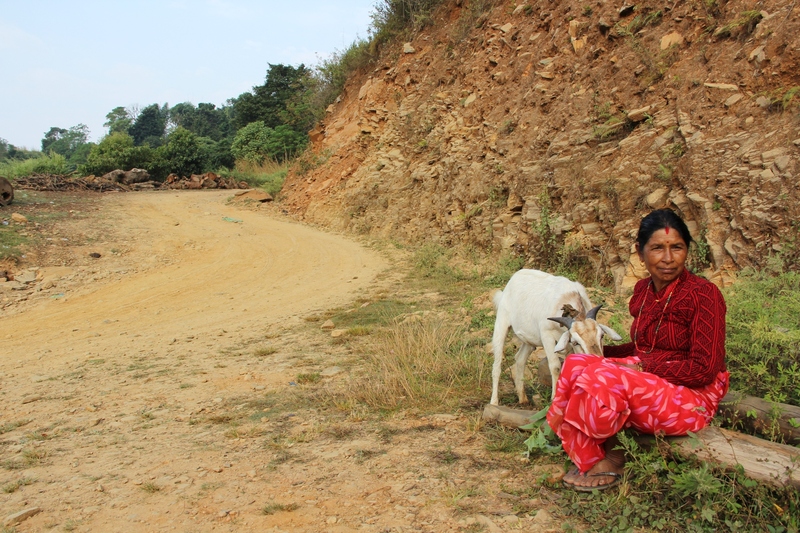 We clambered over rocks that had plunged down the hillside to reach four families who had decided to build temporary shelters next to the remains of their houses, rather than move. Weren’t they afraid of landslides? Their biggest concern was having better shelter, which was too costly for them to build on their own. The yearning for a proper home would become a familiar tale that we would hear again and again during our stay. It was beginning to get dark as we made the hike back to the new village. That evening, Radha, Ram’s mother, prepared a meal of lentils, rice and potatoes for us, all gathered from the farmland. Subsistence farming has become more difficult since the family moved to the new location, as they now have to walk further to gather food from their land, which lies near their old home. As we ate our meal outside the shelter, we began to shiver. The day and night time temperatures in Nepal fluctuate considerably. Earlier on, it had been searingly hot; but now, there was a harsh chill. We could only imagine how cold it might get in the winter, which was fast approaching. The tin sheets would provide little insulation to the villagers. Inside the shelter, two chipped but sturdy double beds occupied most of the space, in addition to two cupboards and a dresser. A line of colourful clothes were hung up across one wall. We slept that night in thick blankets provided by our host, the blare of TV sets from the adjacent houses clearly audible. “We are compromising on even our basic needs,” said Nikesh Parajuli. 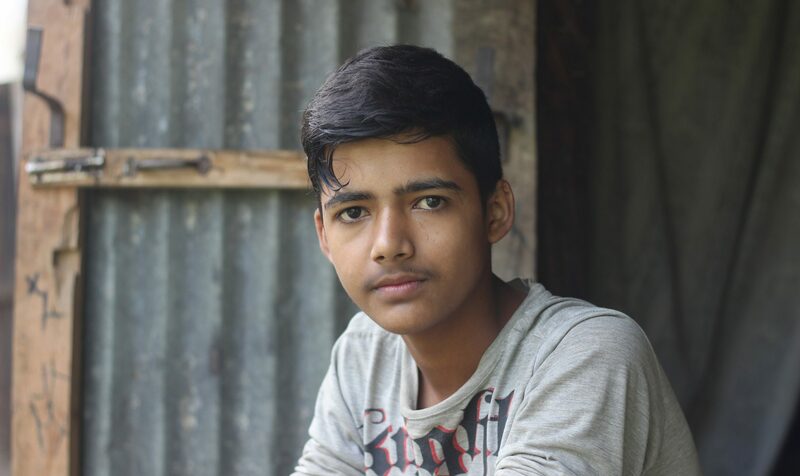 “So building a house is a distant dream.” The 16-year-old’s biggest concern was that he found it difficult to study: being in cramped clusters, the settlement offered little space and he found it difficult to concentrate amidst all the noise. “I don’t even dare to hope for that here,” he said. How could they be sure, we wondered? “Hope is everything,” said Ram, simply. When we broached the topic of politics, the sense of frustration was palpable. So far, households have only received 15,000 Rs (£95), a tiny fraction of the cost of rebuilding a house. One resident, Madan Krishna Adhikari, told us he had already spent that amount clearing the rubble of his old house. “The government is not taking our problems seriously,” he said. “Even the plans of the earthquake-proof houses they proposed have not been released yet.” His biggest needs were getting basic construction materials, such as cement and iron rods, and the capital needed to build the house, he said. As we walked past the remains of another house, a sudden jolt shook the ground. A small girl ran past us into the arms of her grandmother, who had just emerged from a tin shack next to the rubble. 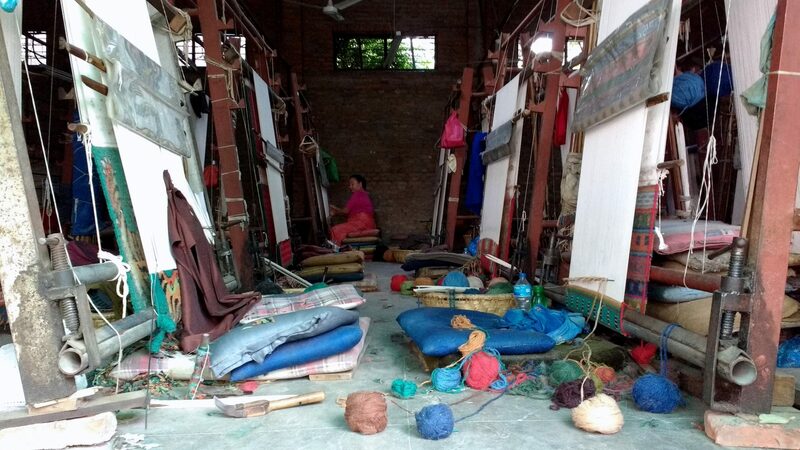 It was the first time we had felt an aftershock in Nepal. But they occur frequently in this part, the villagers told us, providing a constant reminder that the next earthquake could happen anytime. The elderly woman, Bal Kumari Parajuli, told us that before the earthquake her whole family had lived together in the house. But her son and daughter-in-law had decided to move with their young children to Kathmandu shortly afterwards. 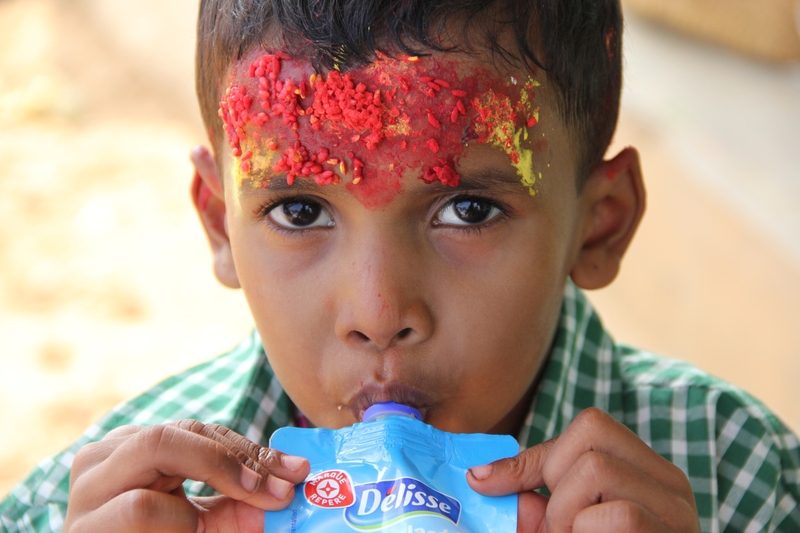 The children have returned to celebrate Dashain. 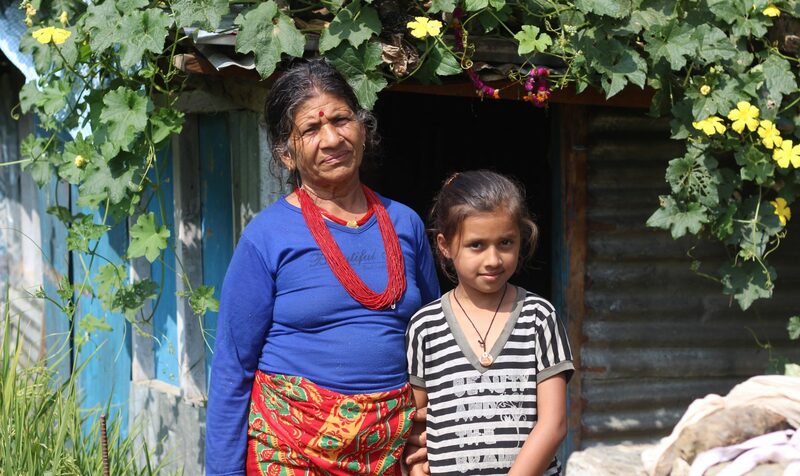 But the earthquake and the destruction of her family home have traumatised Bal Kumari.Every morning she wakes up to the sight of her broken house, which is a perpetual reminder of what happened. Like so many villages in Nepal, Chimling Beshi is a community in limbo, waiting for help that may or may not arrive so that they can rebuild their homes. Normality has been disrupted, but even these circumstances have become normal for the villagers now. 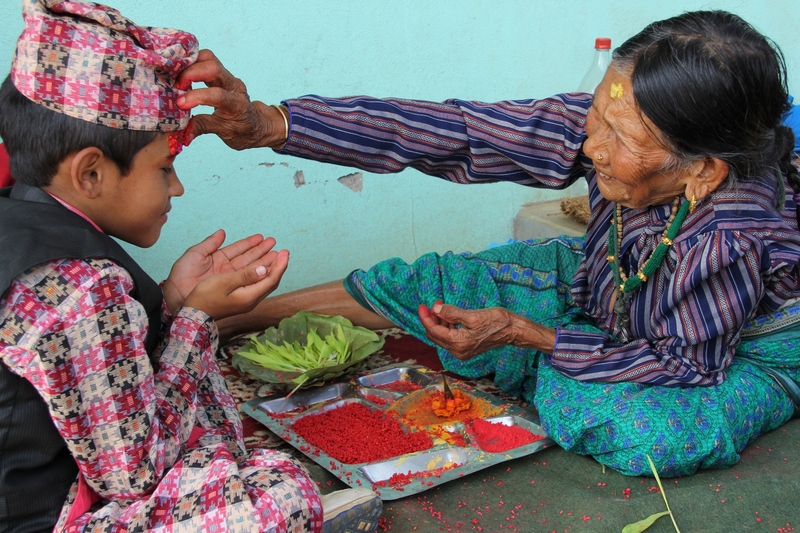 Dashain, the longest and most auspicious festival on the Nepali calendar, came to an end early this week. It was largely a subdued affair, particularly for those who lost their houses in the earthquake six months ago. Chris Maxted recorded how people in Gorkha—one of the severely affected areas, where many now live in temporary shelters—celebrated the 15-day festival. 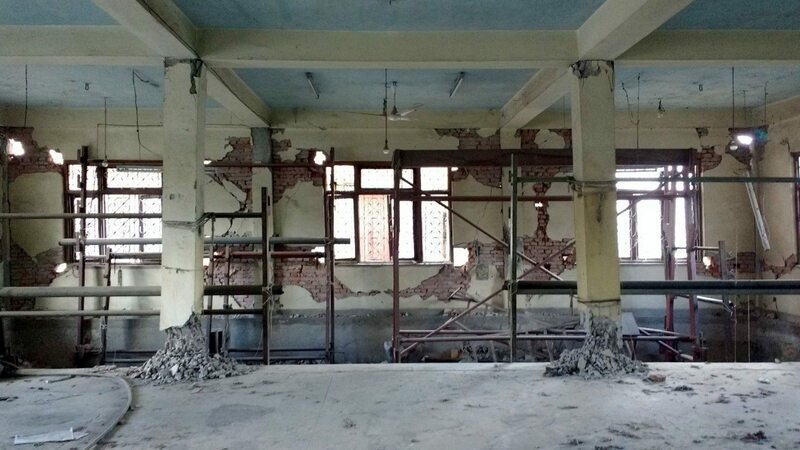 “This Dashain festival is a sad one for many,” said Kshitiz Paudel, Medical Director at the rural Amppipal Hospital, Gorkha. “But there are also a great number of people who feel they still have a reason to celebrate and give thanks.” This time of year sees families travelling, often great distances, to be with loved ones for the undisputed high point of the Nepali calendar. But with many village houses deemed unfit for habitation, the people living in makeshift shelters have marked the first Dashain since the earthquake as a time for reflection. His mother, Bhagbati Thapa, as matriarch of the family, receives kinfolk from far and wide to bestow tika, a significant blessing of good fortune for the coming year. “This is an important tika for us,” added Krishna. “We have to hope for the future.” Their house may be irreparably damaged, but it was still put to good use by the thirty friends and relatives who congregated outside in its shade to eat, chat and play games. For this Dashain, as in previous years, the hills of Gorkha resound with drumming, singing and laughter well into the early hours. Villagers apportioning buffalo meat. 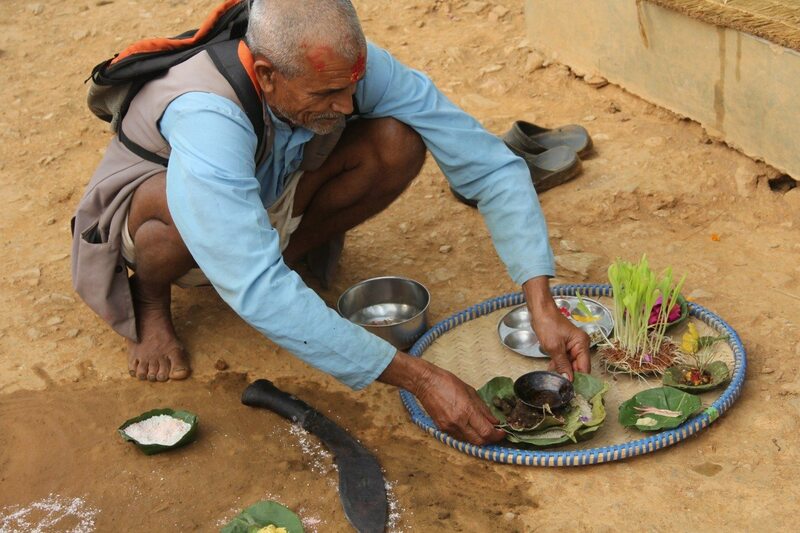 During Dashain, outside every Hindu house, the ground is first sanctified and then either a buffalo or a goat is sacrificed. Eventually, the meat is used for the preparation of a big feast. Chris Maxted is a former schoolteacher from the UK, now a private tutor in Hong Kong. 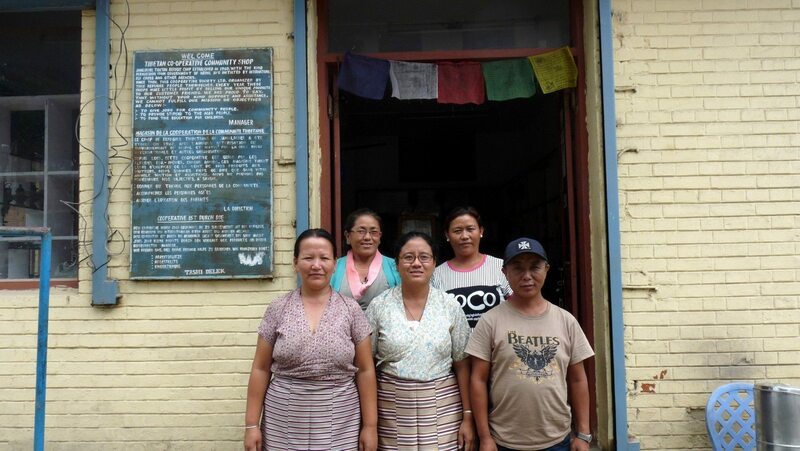 A regular visitor to Nepal, he was in the Gorkha district as a volunteer for the Gorkha Foundation.